To prepare the chicken, dice it into bite-sized pieces. Mince the garlic and place into a bowl. Add the remaining ingredients. Stir to evenly combine, making sure the cornstarch has dissolved. Add the chicken and toss to evenly coat. Set aside. 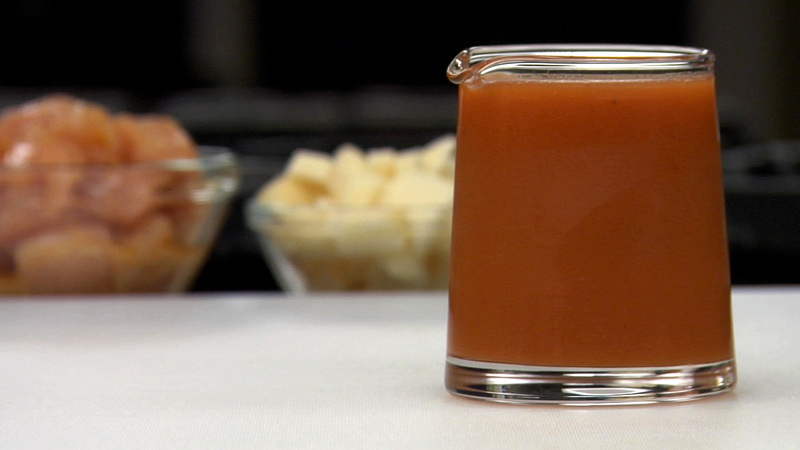 To prepare the sauce, mix all of the ingredients together, making sure that the cornstarch has completely dissolved. Set aside. To prepare your mise en place, mince the garlic and ginger. Cut the stems off of the broccolini florets. Cut into 1" -inch pieces. Place the stems and florets into separate mise en place bowls. Slice the Thai chili on the bias. Note: If you can, use fresh water chestnuts and fresh baby corn. To prepare the water chestnuts, simply cut off the top and bottom and peel the exterior with a vegetable peeler. Place into cold water to prevent them from oxidizing. Drain and dice just before using. To prepare the baby corn, slice lengthwise into quarters. Trim the stem end off of the snow peas, slice the chives and set everything aside. 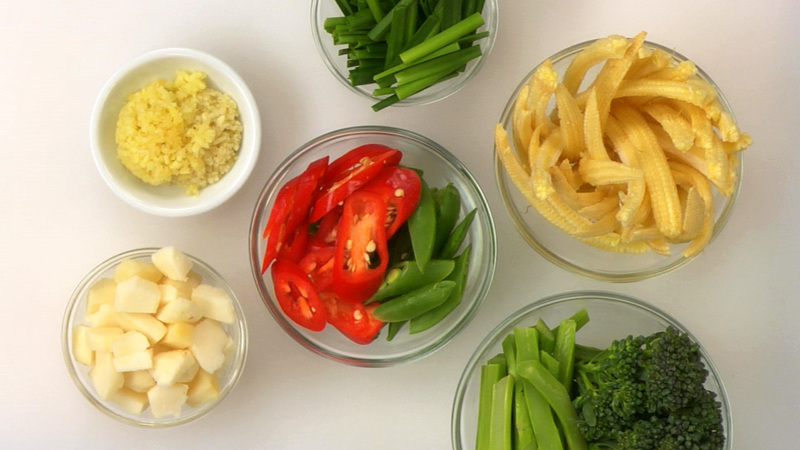 To stir-fry the dish, line the ingredients up in the proper cooking order. Heat a wok over high heat. Once hot, cook the stir-fry according to the basic steps in the lesson. Keep in mind that vegetables should be added in the correct order so that they are all done at the same time. 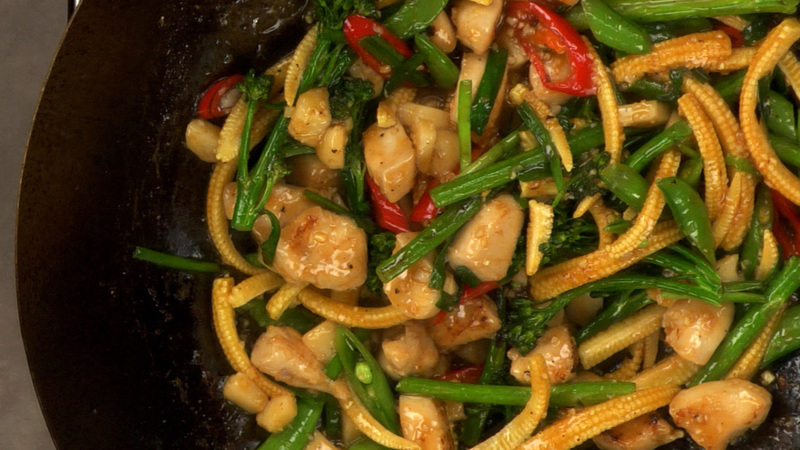 Stir-fry the chicken – remove. 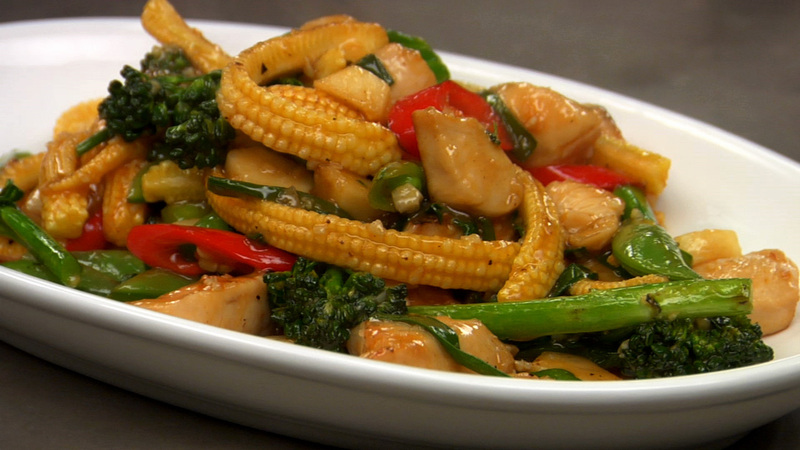 Add broccoli stems — chilies — water chestnuts & baby corn — snap peas — broccoli florets — garlic & ginger — return chicken and juices to wok — add sauce. Finish with chives. Feel free to add a touch more oil during the stir-frying process, if needed. Serve immediately. I made this according to the recipe but was very disappointed in the sauce. I was neither sweet nor sour and the resulting dish was bland. Sorry to hear that you did not like the sauce. I will say that when it comes to "following a recipe exactly" this is not generally what you are looking to do. A recipe often depends on the brand of ingredients used, the amounts of each of the ingredients. For instance, if ones portions or amounts of chicken/vegetables were different then the recipe, even just slightly, this could dilute the sauce. And if one uses a different brand of sauce, it could have a different acidity to it etc. With all of that said, perhaps this sauce just didn't have enough punch for you. Next time you may want to taste the sauce and add a bit more acid and sweetness to it. Hope that helps. Cheers! One of my favorite dishes! The taste is amazing! Thank you !